How do you transform a grocery store plant in seconds, with just two simple kitchen supplies? A fresh plant can make all the difference in cheering up a room, especially during these short days when it gets dark at 4:30pm. Ugh. 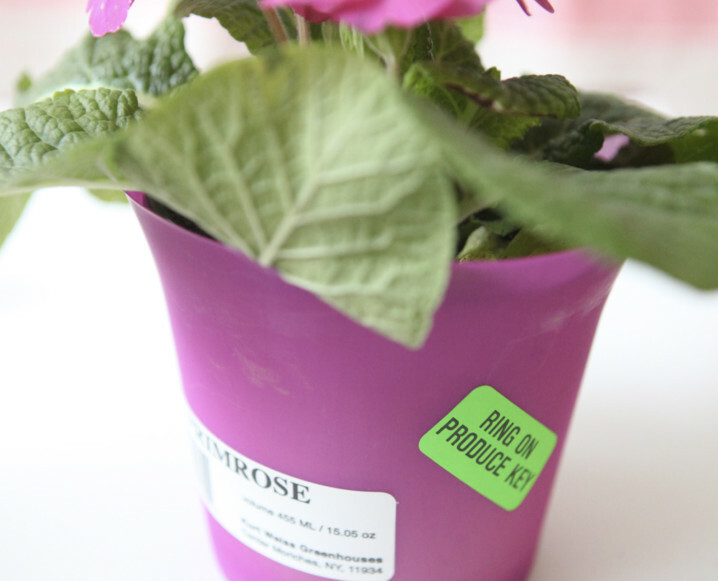 I picked up a pretty little primrose at the grocery store but couldn’t stand the bright pink plastic pot it came in. Unfortunately, I had no other pots that were the correct size, and with guests coming in an hour, I had to improvise a quick and simple solution with what I had on hand. Looking around the kitchen, I saw a roll of parchment paper and a box of toothpicks sitting on the counter. I ripped off a 12″ square of parchment, centered the pot on the square and gently raised up the sides. I grabbed a few toothpicks and skewered the parchment to secure it, and in less than 5 minutes, had a pretty little plant to set on the table. Now there’s a little bit of spring in the room – and just the cure to banish any winter doldrums! For more from Chiara check out her awesome site and Etsy shop! Share the post "DIY Grocery Store Plant"
Beautiful. Quick. And easy. I like. so easy and so simple but it can totally transform a room!